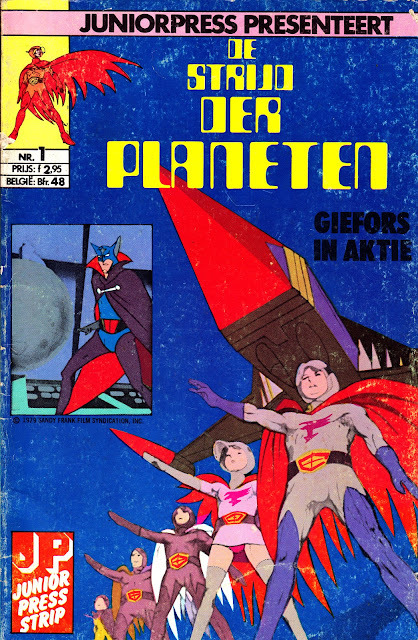 Last week I ran scans from two Dutch BATTLE OF THE PLANETS comic strip albums featuring the Spanish strips I'd not seen before (they didn't reach the US or UK markets, which is a shame). Today, we go Dutch again with two copies of their translations of the US comics published by Western. Each Dutch issue reprinted two US issues, translated of course. As many of the US issues featured two stories, this meant Dutch kids had four self-contained stories per issue. 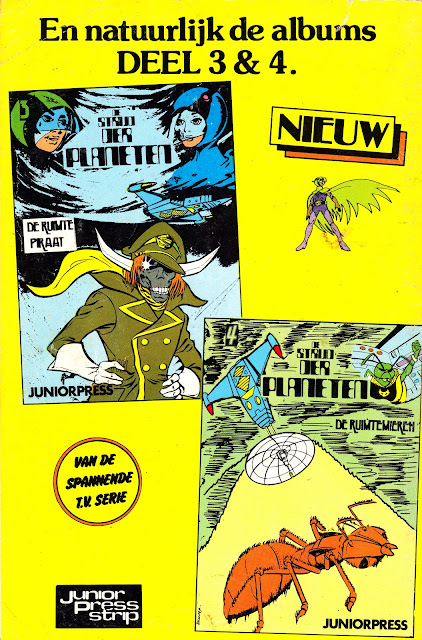 Issue one featured reprints from the first two US issues: Operation Decoy becomes De Ruimtekrab whilst Undersea Threat translates as De Ruimteschildpad. 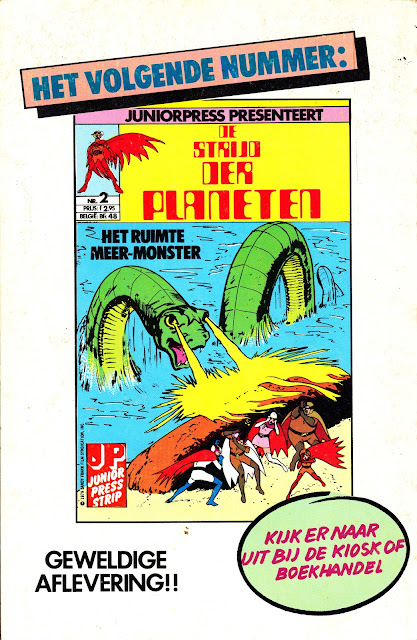 The Ice Creature from Western’s second issue becomes De Ruimtesneeuwman whilst The Flaming Menace translates to De Ruimtevulkaan. I don’t have the second Dutch issue but I see no reason to suspect that it doesn’t contain translations of the 3rd and 4th US issues. 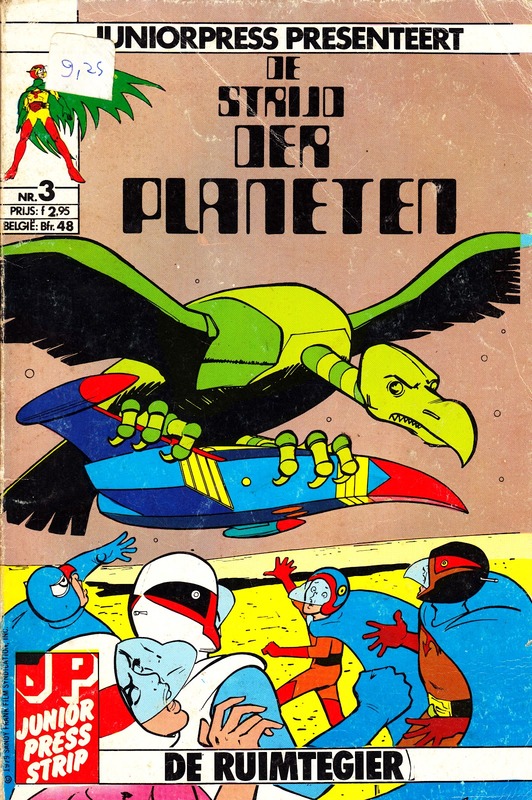 The third Dutch issue reprints the material first seen in the 5th and 6th Western issues: The Hidden Enemy is now De Ruimtevijand and The Vulture Menace becomes De Ruimtegier. The full-length story from Western’s 6th issue, Ghost Ship parts 1 and 2, becomes Het Ruimteoog deel 1 and deel 2. Unlike issue 1, the third edition doesn’t appear to feature a next-issue plug which suggests that maybe only three issues saw print. There were ten US issues. Some of the strips would be familiar to British BOTP fans too: the same US material appeared in the UK annual and the 1983 and 1984 specials.